others I did not catch. who just were, and one can never be taken for the other. Hisoka was a prime example of the latter." What a tremendous beginning to a grand project!! We've been getting visitors (about 12 or 13 years old ... I think) from Mr. Jones class in Scotland. My kids (about 16 to 18+ years old) have started returning the favour. This might turn into a little side trip where we exchange podcasts. I'm not sure if the world is flat. But it's starting to feel like we all live in Whoville. Busy days, late nights and a couple of blog posts I've been trying to write for days but the words aren't coming easily. Terry Freedman asked me to contribute an article the the second edition of Coming of Age: An introduction to the NEW world wide web. It was originally scheduled to be released this month but due to circumstances beyond Terry's control publication has been pushed back to January 2007. Terry recently emailed all the contributors to the new edition to say we should feel free to publish our articles on our blogs in the meantime. The second edition has over 50 articles; I'm really looking forward to reading it. All my classes are hybrid classes. They have both a face-to-face component and an online component. Each class is supported by a blog. The class blog is used in a number of different ways but in this article I will focus on two ideas, Scribe Posts and Feed Windows, pedagogy and audience; the first leads into the second. This straightforward idea has incredibly powerful consequences. Each day, except for test days, a different student is responsible for the daily scribe post. This is worth 5%-10% of their class mark (see below), everyone who writes a scribe post gets their marks -- non-blogging students don't (it's their choice). They end their post by choosing the next scribe. Over the length of the course these scribe posts grow into the textbook for the course, collectively authored by the students; one student at a time, one day at a time. The first scribe is a volunteer. The teacher's daily involvement is limited to updating a post called The Scribe List which is at the top of the links list in the sidebar of each class blog (sample class blog). The Scribe List is an easy way for scribes to see who has already scribed and who they can choose next. Once the whole class has been scribe once we cycle through the class again. I teach in a semester system (full courses are taught in 4-5 month blocks). In my classes, every student will be scribe a minimum of three times; some will write four scribe posts. In this way, the responsibility for teaching and learning is distributed both across the class and the semester. Write a brief summary of what we learned in class today. Include enough detail so that someone who was away sick, or missed class for any other reason, can catch up on what they missed. Over the course of the semester, the scribe posts will grow into the textbook for the course; written by students for students. Remember that as each of you write your scribe posts. Ask yourself: "Is this good enough for our textbook? Would a graphic or other example(s) help illustrate what we learned?" And remember, you have a global audience, impress them. The mechanics for teachers, aside from updating The Scribe List, also requires the occasional reminder to students to stay on top of their scribe posts. Occasionally, if the day's scribe is sick or away for any other reason give the class a few minutes, perhaps while taking attendance, to decide among themselves how they are going to deal with this issue. (One of the ideas behind the scribe post is to make students responsible for their own learning.) This essentially requires that a student volunteer to "cover" for the scribe who should pick up the routine again the next day. This simple idea has lead to some incredible student work. Early scribe posts tend to be entirely text based (example). As the class progresses, successive scribes begin to try to outdo each other and their scribe posts begin to incorporate text, images and colour used in meaningful ways (example). When scribes reach this level of excellence they are inducted into The Scribe Post Hall Of Fame. The students first name only (to protect their identity), grade, subject, link to their post, post date, inductor and reason for induction are all recorded on a wiki. This is a further motivator for outstanding student work as different classes compete to be the Consecutive Hall Of Fame Scribe Post Record Holder. Recognition of outstanding student work. Additional motivation for students to produce their best work. Encouragement for other students to excel. Build students self-esteem by using this forum to generate widespread public recognition. How do you go about writing a scribe post? Do you do anything differently in class when it is your turn to scribe? If so, can you describe what you do differently in class when you are scribe? What makes a scribe post worthy of entry into The Scribe Post Hall Of Fame? Specifically, what should be included in the post for it to achieve this recognition? Compare the first scribe post you wrote to the most recent one. What, if anything, did you do differently? I'm going to patch together three different students answers but all their answers are worth reading. They answered here and here. Manny: "When I write my scribe posts, I try to make it as so my classmates go, "ohh!" and "yeah that's it right on." That is my first priority because I want everyone in the class to do well, "we're all in it together" (at least that's how I feel anyway). During class, if it's my turn to scribe, I feel pressure that if I don't do well in helping my peers I'll let everyone down. So in class, I open both my eyes and ears wider than normal, and my pencil taking notes on just about everything related to the topic." Corrie: "I think to be able to make a scribe post worthy to be in The Scribe Hall Of Fame, is the content. I think that's no. 1. But you also have to look at it differently. You have to be creative with your scribe. I think you should try to be different, do something that no one has done before. You should try to stick out from the group. To be recognized content and creativity is most important ... well that's what I think." Teddie: "When comparing my first scribe and my very recent scribe I can see the quality of the scribes improve greatly mostly because of the competitiveness of the other scribers to make the hall of fame." If you've already looked at the examples I've linked to you'll see the quality of work this pedagogy fosters in students. If not, you may be asking "Why should I do this?" Having a daily scribe has improved both the student's learning and my teaching -- since I insist that they summarize their learning each day I had certainly better provide the content for them to work with. On my professional blog, A Difference I wrote about the impact of having daily scribes on my students and my teaching. I encourage you to read it. In the meantime consider this: Medical school is often considered one of the most academically demanding educational experiences a student can have, and so it should be. The paradigm in medical school that leads to deep learning is "watch it, do it, teach it." Scribe posts will bring that paradigm into your classroom, regardless of what you teach or how old your students are. As a teacher you know that there is nothing like having to teach something that leads to learning it well. Scribe posts make your students teachers ... with a global audience. Once you have created a class blog where students are publishing what they are learning then we can open Feed Windows to each other's classes. Feed Windows are dynamically updated (via RSS) windows into other class blogs. If you can't regularly publish new content to your blog then as long as someone is publishing on a blog to which you have a feed window open new content is added automatically, all the time. This results in really distributing the work of teaching and learning across the globe. Every blog has an RSS feed (see the article earlier in "Coming of Age" by John Evans, What Are RSS Feeds And Why Haven't I Heard About It?). Using one of the (free) services outlined below you can add feed windows to the sidebars of your classroom blog(s). It’s too early to identify all the ramifications, good and bad, of using feed windows, but one thing is clear; there are benefits for both students and teachers. Students benefit by getting access to other students and teachers around the world who are learning the same or similar content. Teachers benefit by keeping the class blog a dynamic environment for students and getting pedagogical inspiration from other teachers. For example, my idea for wiki solution manuals came about because of something I saw happening in another class in the feed window on one of my class blogs. It may be objected that feed windows lead to information overload. Also, what if objectionable content comes through the feed window? The information is there for students who need it or wish to make use of it. They are not obliged to access it. As regards inappropriate content, while possible, it is highly unlikely to occur as students work to outshine each other in their educational efforts. Also, feed windows are only opened to the classes of blogging teachers; the edublogging community is a safe self-monitoring community. Will mistakes happen? Yes, but they really just provide an educational moment for everyone involved. (see my blog post Safe Blogging Resources under the headings Podcasts and Stories From the Classroom). These two ideas, Scribe Posts and Feed Windows, lead naturally from one to the other. Using Scribe Posts encourages student creation of outstanding content. Using Feed Windows distributes that teaching and learning across the globe. This provides fertile soil for more creative teaching and learning with web 2.0 tools. At the time of writing (September 2006) I am aware of five different ways you can get a feed window for your blog. All these tools are free of charge although one will give more design choices for a small fee. These first four sites will generate html code that you just copy and paste into your blog template, the last is entirely automated. You may have to experiment a little until you have the Feed Window placed exactly where you would like it. Keeping it in the side bar makes it always accessible from the front page of the blog. The Grandaddy of them all. Alan Levine really originated the idea of using RSS feeds to redistribute content in the form of del.icio.us links. He not only had the original idea, he created the first tool to make it work. And it's free. This is the tool I use on my professional blog, A Difference, but I also use a little html coding. Grazr is a web 2.0 site that automatically generates the code to produce a Feed Window on your blog. You select an RSS feed and a few formatting parameters with a few clicks of the mouse and the html code is created on the spot. Copy and paste. With Grazr you can actually wrap several feeds into a single Feed Window and graze the content from several classes. FeedoStyle is a similar web 2.0 service to Grazr but each feed will have its own window. Also, formatting options are limited unless you upgrade to a paid account. Prices vary from $5.00 US to $15.00 US. The basic service is free. Blogger (by Google) has recently updated their software. It's currently in beta but has a host of new features that make it superior to the original service. One of those features is the ability to just paste an RSS feed into a form and Blogger will automatically create a Feed Window for you. Then you can drag it to wherever you want it to appear in the sidebar of your blog. It really doesn't get easier than this. Blogger is a completely free blog hosting service. This is the one that I use with my classes. Question: 5 marks just for writing a blog?!? If I wrote, "I really can't be bothered to blog about this, but I need the 5 marks", would that get me 5 marks? No; that wouldn’t be a summary of what was learned in class. Also, it’s not 5 marks, it’s 5 percent of their entire class grade (final marks in Manitoba high schools are composed of 70% of the class grade + 30% of the final exam grade). To the kids this makes it sound as though it is a significant part of their final grade. (I use the terms "grade" and "mark" interchangeably. Depending on the context it means either individual points on an assessment or the sum total numeric grade used to indicate a student's achievement.) Last year, as a result of the outstanding amount of time, energy and effort students put into their scribe posts their grade value was increased to 10% of the class mark. My grade 12 Pre-Cal 40S class handed in their first project today. Tomorrow my grade 11 Pre-Cal 30S will get their first project assignment. 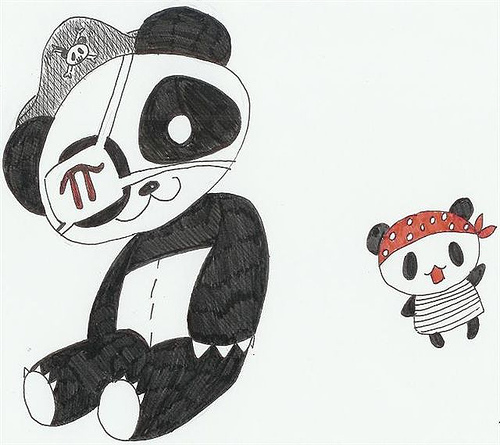 My AP Calculus class has begun work on their digital story; this year's project is called Pedro the Pi-Rate Panda (nothing there yet; the first problem will be published next week). My son (grade 5) spent the better part of the last month working hard on a project about porcupines. He uncovered lots of interesting facts and taught my wife and I a few things as well. He even shared some of his learning with the folks at Ed Tech Brainstorm on October 19 (both my kids come in at the 25 min 45 sec mark -- yeah; I'm a proud papa ;-)). He received the graded assignment back last week. His mark was not what he was hoping for. We were surprised by the assessment criteria. The original sheet of instructions did not detail some of the characteristics that were part of the final assessment scheme. We also thought it would have been helpful for our son to know the weighting of the different factors that were being assessed. In the course of my recent research and learning about assessment, the idea of making success criteria transparent is emphasized again and again. I want my students to succeed. As a class our goal is for everyone to achieve between 80% and 100%. 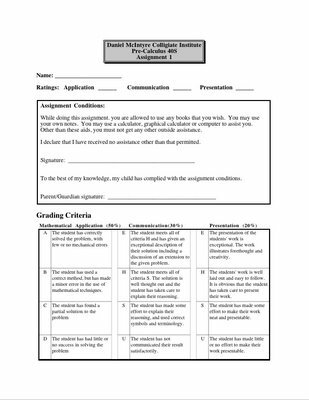 I have structured my assessments (above) so that students can achieve, with a reasonable amount of effort, marks in the high 80s. I spent a lot of time discussing with the students what excellence looks like. I showed examples of past students work. 50% of their grade is for the math content. I told them up front, "If you come talk to me about it I will walk you through it until you understand and get it perfect. That means you'll be guaranteed a perfect score for the mathematics which automatically means a grade of 50%. If you write a careful description of how you solved the problem and what all the numbers mean, coupled with a neat presentation including a cover page in a duo-tang folder your Communication and Presentation marks will fall at least in the second highest category -- you'll get 88%." We also talked about how a flashy presentation isn't what I'm looking for unless it adds to the clarity of the mathematics. Students have turned in "webs sites" and failed this assignment. Flash and glitter don't earn the high marks; high quality content does. I found myself questioning the validity of grading the student's "Creativity." How do you mark creativity? Sir Ken Robinson's presentation from Ted Talks was a strong motivator for including and encouraging student creativity in my student's work. I have spent more time developing this rubric (above) than any other. 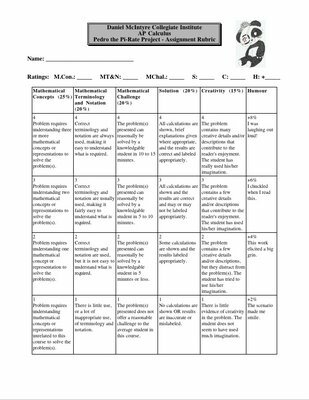 I used RubiStar to help get ideas for building the rubric. 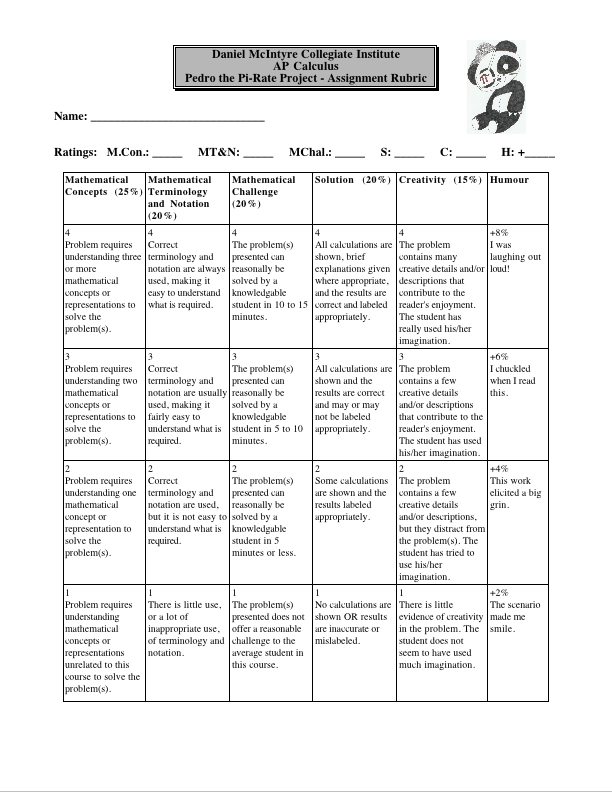 I mixed and matched rubric classifications from mathematics, writing, art and more. Then I reworked those basic ideas into what appears above. In class we talked about rewriting some of the descriptors and redistributing the weighting of the various categories. I was particularly concerned that they would have a good grasp of what excellence would look like and what they had to do to achieve it. I have set a personal goal for myself to work on in my pedagogy this year. I want to more fully explore and implement the use of assessment as learning into my teaching practice. This is not to say that I feel I've "mastered" the use of assessment of learning (what we call summative assessment in Canada) or assessment for learning (formative assessment). I see tremendous value in assessment for learning as it helps to move my students forward in their learning and provides me with feedback to help them learn. »Assessment Is For Learning web site from Scotland. »Assessment as Learning in Mathematics, a research paper by Corinne Angier and Hilary Povey from the University of Wolverhamton in the UK. »Lessons Learned from Research, articles from NCTM's Journal for Research in Mathematics Education rewritten to be more accessible for teachers as opposed to researchers. »Mathematics Assessment: A Practical Handbook for Grades 9-12 another NCTM publication ... on my wishlist (don't have it yet). The wiki solution manuals I started with my classes last year also exemplify assessment as learning in line with peer assessment and reflection. I'm planning to evolve these assignments this year to incorporate goal setting by having this year's students do some work on last year's wikis before they begin the creation of their own wiki solution manuals. More about this in a future post. I began this year by calling these assessments, in my head at least, Learning is a Conversation assignments. I think learning conversations naturally facilitate self/peer assessment and reflection. Blogs are ideal tools for having these sorts of conversations. Students participate without feeling self-conscious or shy because the computer screen creates an arm's length distance between them and I. I also believe they feel less "judged" and so are more forthcoming in sharing their thinking. There's something about typing your thoughts on a blog. The keyboard leads to more writing (not sure why that is) and the fact of publishing their thinking for an authentic audience makes the task more meaningful ... maybe that's why they write more. What follows are synopses and links to the first four assignments I've given in two of my three classes along the lines outlined above. I will be exploring this further over the course of this school year. I've blogged about this previously. The structure of this assignment was exactly the same as the previous one. There were five different True or False statements about logarithms. The groups had to decide whether or not the statement they were working with was true or false. If true they had to explain, justify, why they thought the statement was true. If false, they had to explain the nature of the error and illustrate the correct application of the misconstrued concept. This was the first assignment of this sort with my grade 12 Pre-Cal class. They were given a trigonometric modeling problem. (A real life application of trigonometric equations ... well, maybe not "real life," but the principles are the same in all problems of this sort.) Whoever left the first comment had to solve the problem. All subsequent students had to leave a meaningful comment. A "meaningful" comment was one that (a) if the student thought the solution was correct offered a rationale for why they thought that or (b) if the student thought the solution was incorrect they had to explain why they thought that and correct it. Students received full marks for making a reasonable attempt and no marks for comments that were not "meaningful;" comments that lacked any evidence of thought. This is what Shirley Clarke (see above) would call "attempt marking." The type of problem assigned has historically been exceptionally poorly done by students in this course. Jho-ahn was scribe that day so she was excused from participating in the problem. She had the responsibility of posting it as anindependant post, for which she received full marks. Another assignment for my grade 12 Pre-Cal class. This wasn't planned in advance. In class we were discussing the nature of the domain of logarithmic functions. I asked the class" "Can the argument of a logarithm function be zero? Explain your reasoning." We had discussed this several times in class before. Their oral answers were confused, lacked confidence and illustrated a host of misconceptions about an idea I had thought was very clear. We ended up having a 15 minute class discussion around this topic and still failed to have one student state the correct answer with confidence. It is not my habit to answer questions directly if I have covered the material before in class. I prefer to ask a series of questions to encourage students to recall what they've learned and draw out the connections between concepts that have been previously acquired ... I want to help them figure it out for themselves; if I just tell them the answer they don't learn it and come to rely on me over much for answers in general. Time was running short and I had new material to cover that day. On the spur of the moment I told them we would do with this question as we had done with Jho-ahn's bicycle. Overall I've been pleased with the depth of thinking the students are doing on their blogs given these sorts of assignments. Just the other day the domain of a logarithm function came up again in class. Everyone immediately understood what was being discussed and seemed to have a good grasp of the problem and solution. In the coming weeks I plan to do more of this and include this kind of assessment in my grade 11 Pre-Cal class. At least two other teachers have also picked up the idea and are using it with their students. Vicki Davis (see her post Wikis and the Power of Internet peer review!) and Chris Harbeck (see his posts Oh no I have done something wrong and Oh No I goofed Again). Chris is taking a different approach. He posts a problem and solution but the solution is wrong. In the comments to the post students must identify the error and correct it. The nomination period closes on November 30. Copy and paste this blog post as a template for your submissions. Nominations can be sent to 2006awards@googlemail.com ... don't dely, get yours in today. Group: a number of people or things located, gathered, or classed together. Network: a group of people who interact together. Community: 1 a group of people living together in one place. 2 (the community) the people of an area or country considered collectively; society. 3 a group of people with a common religion, race, or profession: the scientific community. 4 the holding of certain attitudes and interests in common. Last week I wrote a post called Coming of Age where I tried to articulate my discomfort with what I believe is a natural consequence of how the edublogging community has been growing. Namely, the advent of naysayers and critics who express their disagreement with the views or practices of others through personal attack. It generated some comments, most of which were of a "cheer me up" sort of sentiment for which I'm grateful. Graham Wegner both left a comment and continued the discussion on his own blog. This is my attempt to reply to the issues Graham raised. The focus of Graham's comments revolve around my taking exception with a post by Stephen Downes called That Group Feeling and his definitions of groups and networks. Leigh discusses Stephen's views here and Stephen speaks about his views here. In That Group Feeling Stephen objects to the formation of groups bound by emotional attachments where individuals are excluded from participation; often painfully. He relates this to schoolyard cliques; where being on the "out" side of the "in" group is exceptionally painful; particularly at a time in a young person's life when they are struggling with their personal identity formation. He extrapolates from this to unspecified learning theories that are detrimental to the growth and education of individuals who don't fit that(?) particular educational paradigm. In the video on Leigh's blog and in Stephen's talk he contrasts the concept of group with that of networks. Groups are exclusionary, requiring membership to belong, closed systems with a "leader" at the helm uniting individuals through their emotional attachments to each other or the group concept. A network is an open collection of autonomous individuals united by rational thought. Graham asks: "What do you hear when you read that post?" I'm still no closer to really understanding what community means to me. Or to anyone else, for that matter. I can only say what community, in this context, means to me. The edublogging community is a group of people with a common profession that have certain attitudes and interests in common. It is an open, diverse group made up of autonomous individuals. It is a network of people (and groups) who come together to share their experiences, frustrations and successes with an eye towards improving themselves professionally and personally. Ultimately, we are all interested in the same thing: improving the education of the children in our lives. The great strengths of this community lie in it's opennesss; anyone is welcome to join in the conversation. 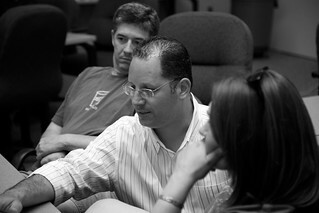 The nature of our online connections has resulted in a network of people most interested in each others thoughts and ideas; in stretching and pushing our thinking to explore the boundaries of our teaching; to extend ourselves beyond our comfort zones and take risks as we grow professionally and personally. There are leaders among us. But the leadership changes as new voices join the conversation. And what counts as leadership among us is the willingness to share a new idea, a new pedagogy, a risk that we plan to take or have taken, to be transparent in the way we do our work in a profession that has historically been very closed and private with individuals working in isolation. We each take our turn as leader every time we do something to extend the dialogue in the community. The K12 Online conference was an example of this. I may have been one of three people that helped nurture it to fruition, but I was not alone and the three of us were not the only leaders. Every presenter was leader. Every commenter who challenged the presenters was another type of leader. And the many people who volunteered to be moderators (many of whom had never been part of a skypecast before let alone been a moderator before) for When Night Falls, the closing event, were leaders who stretched the boundaries of their comfort zones. One outgrowth of When Night Falls is that a group of teachers from all over the world plan to continue learning and sharing together in monthly adaptations of When Night Falls called When Night Starts Free Falling ..... The leadership of that event has nothing to do with Wes, Sheryl and I. The leadership has passed to Chris Harbeck for December. The community will figure out for themselves who will lead the next conversation. This community has all the values and characteristics that the schoolyard cliques I grew up with didn't. I'm proud to be a part of it. And if anyone else would like to join it then all you have to do is the click the [comments] link below any blog post on the internet. 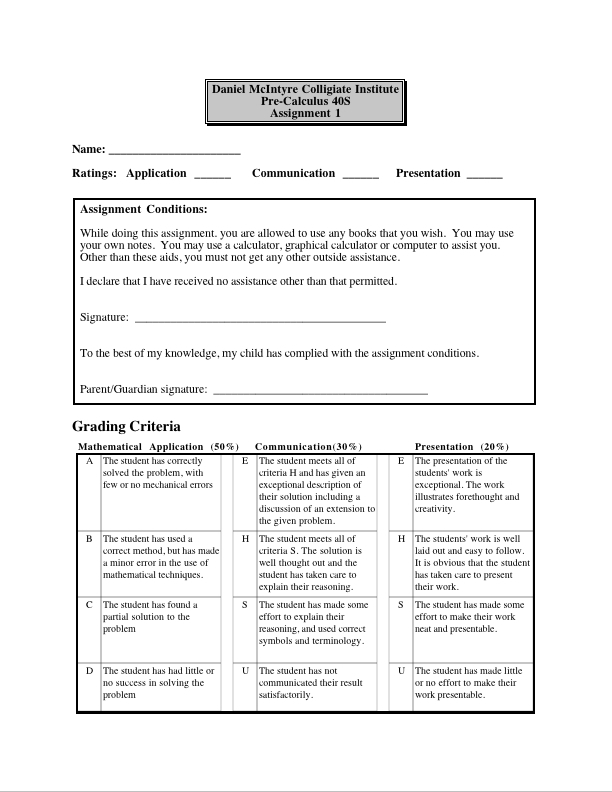 If you have viewed any (even one or just part of one) of the presentations for the 2006 K12 Online Conference, please take a few minutes and complete the post-conference online evaluation form. The deadline for submitting the survey is Sunday November 12, 2006. "OK, Daddy, what was that about?" You have to be really careful about the people and things you see in magazines, on TV and on all kinds of ads. Any picture, video or sound can be edited by anyone. Those pictures look like they are real people ... many of them aren't. Many of the "fancy girls" you see don't really look like that. Who you are on the inside will always be far more important than what you look like on the outside. There's a lot to learn. If you want to do cool stuff, like fly a plane, then you have to learn some hard stuff, like physics. And the hard stuff, like math, it's about a lot more than numbers. Learn everything that you can from everyone you can because it's all connected, even if you don't see all the connections right now. If you never learn it you'll never have a chance to put the pieces together. What would you tell your kids? Taking the lead from Jeff Utecht we had a little K12 Online LAN party at my school. I was talking with my principal a few weeks back and the conversation turned to professional development. I turned to him and said: "If you're really serious about educational technology in our building give me some money ... a half day for 20 teachers and I to spend in the iMac lab and I'll take them to the conference. They can explore anything they like from the 33 presentations available (at that time, Nov. 1) and I'll help them with any tech issues that come up ... I'll also show them how to use skype so they can participate in the closing event, When Night Falls." He said yes to 10. The offer went out to almost 60 teachers in my building. Three replied and one was sick the day of the event. We (Liz, John and I) watched David Warlick's Kenote presentation and recorded the conversation we had afterwards. grr .. the last questions are troubling me ..
hi all. good site. thanks. Greeting... The Convenient site, the sated site! wow, =) i'm glad that people from other places find our blog useful! hi everybody! These spammers, by creating a sense of global audience, are having a positive effect on some of my students; actually encouraging them to greater heights because they underscore the sense of audience on the class blog. It occurs to me that maybe this isn't really such a good thing. Some students can't distinguish between spam and genuine comments! There are implications for teaching kids to be discriminating consumers of information in all this. I guess I'll come clean with them in class tomorrow ... they've got to learn this stuff somewhere. So what's the incidental learning going on in my classes now ... math? or information literacy?